Human blood is made up of red blood cells, white blood cells, and plasma. Each of these components plays important, specific roles. The primary role of red blood cells is to deliver nutrients and oxygen throughout the body. Anemia is a condition that occurs when there is a decrease in the number of circulating red blood cells and it is the most common hematologic problem internal medicine specialists and family physicians encounter. Because sufficient, healthy red blood cells are so crucial to our wellbeing, it is important to detect and treat the underlying cause of anemia when it occurs. Anemia is the manifestation of other physical problems and the degree of anemia is often an indicator of the degree of underlying illness. The key to treating anemia is to determine the fundamental cause and then treat that condition. There are many causes of anemia. One of the most common causes is iron deficiency. This can develop as a result of the loss of blood, which can be indicated by dark stools, heavy menstrual flow, or blood in the urine. It can also be due to poor absorption of iron. People with celiac disease, strict vegans, and people who have undergone gastric bypass surgery are at increased risk for iron deficiency. 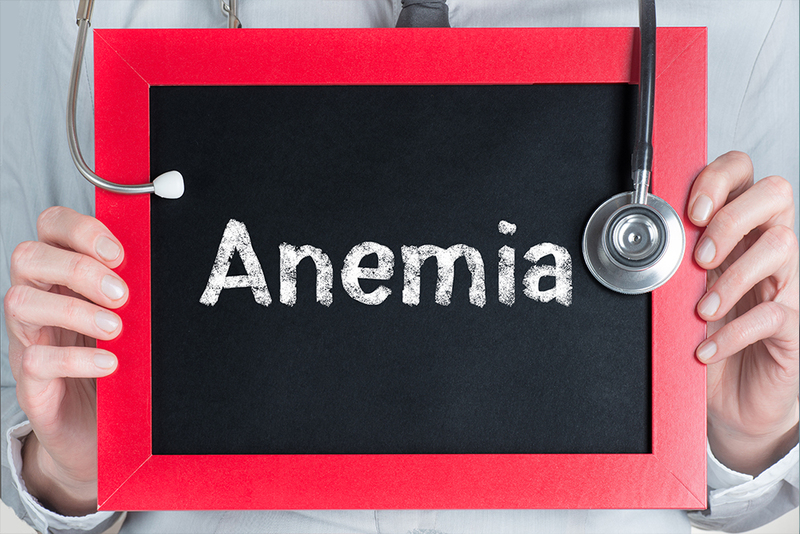 Other common causes of anemia include decreased production of red blood cells due to vitamin deficiency, infection, drugs, or chronic illness, such as kidney disease, inflammatory arthritis, or cancer. People with autoimmune illness are also at higher risk for anemia due to increased destruction of red blood cells, a process called hemolysis. What are the most typical symptoms of anemia? While symptoms can vary, they often include fatigue, shortness of breath, fast heart rate, and even heart failure. Other symptoms include spooning of the fingernails, a smooth, glossy tongue that is painful, and the urge to eat ice or dirt (pica), and neurological problems such as confusion, memory loss, and gait instability. Because the causes vary, the treatments also vary. The challenge is to diagnose the cause. For example, if you have iron deficiency due to celiac disease (intolerance to gluten), you will start to feel better once you are on a diet that excludes grains such as wheat, barley, rye, and possibly oats. If your iron deficiency is due to heavy menstrual flow or blood in your stool, your doctor will recommend ways to minimize blood loss. If your anemia stems from a diet low in iron, you may need to change your diet and undertake iron replacement therapy. Correcting anemia can take two to three months and you may need an additional six months of iron therapy to fully replenish your system. Can anemia be caused by insufficient vitamin B12? Yes, vitamin B12 deficiency is a very common cause of anemia, particularly in the older population. An estimated 5 percent of people between the ages of 65-74 have anemia caused by vitamin B12 deficiency and the percentage increases to 10 percent of the population over the age of 75. Are the symptoms of vitamin B12 deficiency different? Yes, these symptoms can be different from other types of anemia. The symptoms include neurological problems, such as numbness in the hands and feet, loss of balance, personality changes, fatigue, and reversible dementia. These symptoms are even more troubling because they can show up before the anemia is detectable by blood testing. Anywhere between 180-914 pg/mL (picograms per milliliter) is considered a normal level of vitamin B12. However, symptoms can develop if your B12 blood levels are under 300-400 pg/mL. The good news is that it is possible to resolve B12 deficiency anemia in eight weeks with an intensive course of B12. It takes about eight weeks for neurological symptoms to resolve, with full recovery within a year’s time. Dr. Campbell is on the medical staff of Cayuga Medical Center and is in practice with Cayuga Hematology Oncology Associates, where she can be reached at (607) 272-5414. Dr. Campbell treats all types of cancer and blood disorders. During her fellowship training at Columbia, she was recognized as Physician of the Year and Fellow of the Year.